When living with roommates, it can be tough to coordinate bills, chores, and schedules. 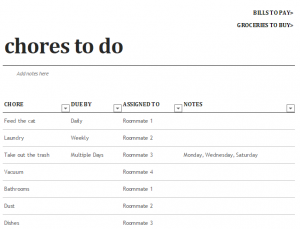 The Roommate Expense Excel Template is a simple and effective Excel chart to organize each roommate’s responsibilities, chores, and monthly payments. The Excel file can be downloaded using the link below. The first page is focused on each roommate’s monthly bills. The expenses that are already entered are just suggested, so delete or change any that don’t apply. In the amount column, put the exact amount that each expense costs monthly. The “Total” at the bottom will be automatically calculated for you. Next to the amount, list the name of the Roommate(s) in charge of that expense, and use the Notes field to list explanations for why someone pays more or less. Go to the bottom and choose the tab that says “Chores”. The first column lists the actual chore (change or delete as needed), and how often it needs to be done. Then, put the roommate(s) name that is in charge of that chore. Use the notes column to list any exceptions. Finally, go back to the bottom and click the tab that says “Groceries”. This page does not have its own space for what roommate is in charge. Instead, it is a general list of what the household needs. If you are the only roommate that eats bacon, then put bacon on your own personal shopping list. Items such as paper towels and window cleaners that the whole house uses should be listed here. You and your roommates can decide who will pick up these items and how often. The “laundry” chore is especially handy as you can know when the laundry machine is available and plan accordingly. Print and post these Excel sheets in an easy to see area so that all roommates can access it and even check off bills, chores, and groceries that have been completed. If a roommate moves out or goes on a long vacation, print a new sheet so that someone can cover their responsibilities.